In addition to my daily posts I would like to start making it possible for my readers and fellow bloggers to contribute to the site. This has been something that I have wanted to do for quite some time. I have wanted to create a place that will bring people back time and time again with new and interesting content. So I thought getting my readers involved would be one of the best things. Due to the fact that I use WordPress it makes it really easy to make multiple authors on a blog possible. If this proves to be a success I would like to make it possible to have regular authors on the site. Examples of sites such as this are beauty department / hello giggles etc. It would allow you to post to my community of readers; this would get your posts seen by them thus potentially reaching a much wider audience. All the posts that you have created will have a link to your social network and blog via the author box at the bottom of the post, as well as the correct markup for Google results making is a really good way for everyone to see extra content. I would be looking at articles that cover areas such as DIY, Skincare, Nail Varnish, Product reviews. Basically anything that you think would feel at home on a beauty blog! The only requirement I have is that the post is unique in terms of content and photography. It will also have to be a minimum of 300 words and decent photography. Once submitted to myself I will try to get back to you within a few days, before letting you know if it was a successful or not. So if it isn’t you can still post it to your site. Do you edit the posts? All posts will have a once over by myself, making sure that you didn’t miss any obvious spelling errors / grammar errors, as well as sorting layout correctly for my site. Once that is done I’ll send you an email over when it’s ready to go up to let you know when it will be posted. How do I get involved and submit blog articles? 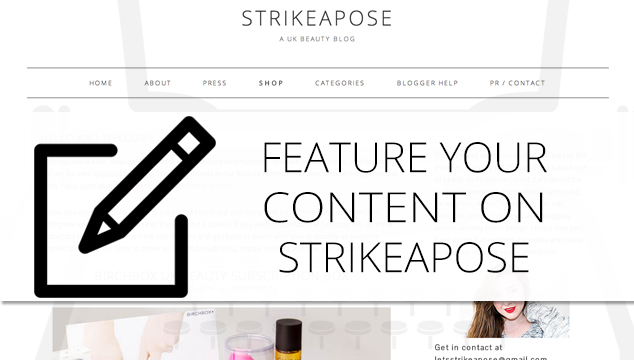 Just use the form at the top of the site or send an email to letsstrikeapose@gmail.com with the article to myself. If you have any questions let me know below. I hope that you look forward to this as much as I do!